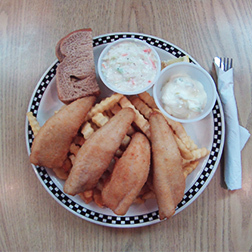 The Friday night fish fry is a tradition in Sheboygan, Wisconsin. There's many places to choose from but only freshly prepared fish make our list! There are bars, pubs, taverns, restaurants, V.F.W. posts and the Schwarz Fish Market, all using their own secret fish batter recipes. Be sure to tell them the "Sheboygan Fishing Guy" sent you! AL & AL'S Stein Haus. Map. 1502 South 12th Street. 920-452-5530. Perch, Cod and Shrimp. Friday, 4p.m. to 9p.m. 8th Street Ale Haus. Map. 1132 North 8th Street. 920-208-7540. Perch and Shrimp. Friday, 11a.m. to 10p.m. Anglers Avenue Pub & Grill. Map. 518 South Pier Drive. 920-395-2406. Perch, Blue Gill, Cod, Haddock, Tilapia and Shrimp. Friday, 11a.m. to 10p.m. Bumps Bar. Map. 1902 South 12th Street. 920-452-4669. Perch, Walleye and Shrimp. Friday, 11a.m. to 2p.m. & 4p.m. to 9p.m. Charcoal Inn North Restaurant. Map. 1637 Geele Avenue. 920-458-1147. Perch and Shrimp. Friday, 11a.m. to 7p.m. Charcoal Inn South Restaurant. Map. 1313 South 8th Street. 920-458-6988. Perch and Shrimp. Friday, 11a.m. to 9p.m. Culver's Restaurants. Map. Cod and Shrimp. 2510 Washington Avenue. 920-395-2527. Daily, 10:30a.m. to 10p.m. 641 South Taylor Drive. 920-451-7150. Daily, 10a.m. to 10p.m. 4225 Highway 42. 920-459-4821. Daily, 10a.m. to 10p.m. Duke Of Devon Restaurant. Map. 739 Riverfront Drive. 920-458-7900. Haddock. Daily. Lunch, Tuesday thru Thursday, 11a.m. to 2p.m. Friday thru Sunday, 11a.m. to 3p.m. Dinner, Tuesday thru Thursday & Sunday, 5p.m. to 9p.m. Friday & Saturday, 5p.m. to 10p.m. Fountain Park Family Restaurant. Map. 922 North 8th Street. 920-452-3009. Perch and Shrimp. Daily. Sunday thru Thursday, 11a.m. to 9p.m. Friday & Saturday, 11a.m. to 10p.m. Four Of A Kind Bar. Map. 811 Indiana Avenue. 920-457-0977. Perch, Cod and Walleye. Daily. 11a.m. to Midnight. Gosse's Restaurant & Pub. Map. 1909 Union Avenue. 920-457-8696. Perch and Shrimp. Daily. Tuesday thru Saturday, 11a.m. to 7p.m. Highland House Restaurant. Map. 820 Indiana Avenue. 920-451-1500. Perch, Cod and Walleye. Friday, 11a.m. to 10:30p.m. Lakeshore Lanes, Strikes Bar & Grill. Map. 2519 South Business Drive. 920-458-1352. Perch, Blue Gill, Walleye and Shrimp. Friday, 10a.m. to 10p.m. Majerle's Black River Grill. Map. 5033 Evergreen Drive. 920-803-5115. Perch, Haddock, Scallops and Shrimp. Daily. Tuesday thru Friday, 11a.m. to 10p.m. Saturday, 3p.m. to 10p.m. Sunday, 12p.m. to 7p.m. Manning's Irish Pub. Map. 3015 North 15th Street. 920-208-0343. Perch, Cod and Shrimp. Friday, 11a.m. to 10p.m. On The House Bar. Map. 1153 High Avenue. 920-458-6711. Perch. Friday, 11a.m. to 10p.m. Petek's Tavern. Map. 2702 South 8th Street. 920-452-6504. Perch and Shrimp. Wednesday & Friday, 11a.m. to 10p.m. Randall's Restaurant. Map. 3827 Superior Avenue. 920-783-6030. Perch and Walleye. Friday, 10:30a.m. to 9p.m. Scenic Bar & Restaurant. Map. 1635 Indiana Avenue. 920-452-2881. Perch, Blue Gill and Walleye. Friday, 11a.m. to 2p.m. & 3:30p.m. to 10p.m. Schulz's Restaurant. Map. 1644 Calumet Drive. 920-452-1880. Perch and Shrimp. Friday, 11a.m. to 8p.m. Schwarz Fish Market. Map. 828 Riverfront Drive. 920-452-0576. Perch, Catfish, Orange Roughy, Oysters, Whitefish and Walleye. Daily, take-out only. Monday thru Thursday, 8a.m. to 6p.m. Friday, 8a.m. to 8p.m. Saturday, 9a.m. to 4:30p.m. Sheboygan Family Restaurant. Map. 2704 South Business Drive. 920-803-9627. Perch. Daily. Sunday thru Thursday, 6a.m. to 9p.m. Friday & Saturday, 6a.m. to 10p.m. Perch and Cod. Friday, 6a.m. to 10p.m. Shuff's Last Resort Restaurant, Pub & Bakery. Map. 4136 Highway 42 North. Perch & Blue Gill. Daily. Tuesday thru Saturday, 11a.m. to 10p.m. Sunday, 11a.m. to 10p.m. Superior Bar & Grill. Map. 2607 Superior Avenue. 920-783-6707. Perch. Friday, 11a.m. to 9p.m. Tommy's Bar & Grill. Map. 2335 North 15th Street. 920-457-6414. Perch, Cod and Shrimp. Friday, 11a.m. to 9p.m. Town & Country Golf Course. Map. W1945 County Road J. 920-467-2323. Perch, Blue Gill, Cod, Haddock, Walleye and Shrimp. Friday, 4p.m. to 10p.m. Urbane Bar & Grill. Map. 1231 North 8th Street. 920-783-0814. Cod and Shrimp. Friday, 4p.m. to 9p.m. V.F.W. Post 9156. Map. 552 Evans Street. 920-458-0801. Perch, Blue Gill, Cod, Haddock, Walleye and Smelt. Friday, 4p.m. to 8p.m. V.F.W. Wolf-Olson Post 1230. Map. 1138 Union Avenue. 920-457-9775. Perch, Haddock, Walleye, Scallops and Shrimp. Friday, 4p.m. to 9p.m. Weimann's Sports Center Restaurant & Bar. Map. 4604 South Business Drive. 920-395-2670. Perch, Blue Gill, Cod and Shrimp. Friday, 11a.m. to Midnight.